Hey.. Hey.. Hey?? Fellow Book lovers I am back today with a review on a book I purchase. The Book is Melissa de la Cruz, “The Isle of the lost”. It is the first book in the original Descendant Series. It was originally publish before the first Descendants movie. I purchase it recently from Amazon since the Second Descendants movie will be out in July, And I have wanted to read all of the books since the first movie. Now lets get to the summary of the book along with the review. This book is about How Mal, Evie, Jay and Carlos all become friends. It starts out with Mal being banish from Evie Birthday party. Then 10 years later, give or take they end up in the same high school. Evie is the Isle only Princess per say, so the villains treat her as such. Mal wants to find a way to get revenge on Evie, so she ends up throwing a party at Carlos Home. Things go wrong and Carlos by the use of an invention of his, ends up causing a rift in the isle magical concealment dome. This leads to Maleficent, to believe that Magic has return to the Isle. So Maleficent sends Mal out to retrieved her dragon scepter, to gain power over the whole Island. In return Mal convinces Evie, Carlos and Jay to help her find the Scepter which leads the kids on an adventure. To find out what really happens, go borrow or purchase the Isle of the lost for yourself. Now onto my thoughts about the book. I would like to be very clear before I begin that I am looking at this book from the eyes of an adult. I do believe that Young Children would find this book far more enjoyable then I probably did. I also believe they would not notice the comparisons that I am about to make. So lets begin with my thoughts on the book. 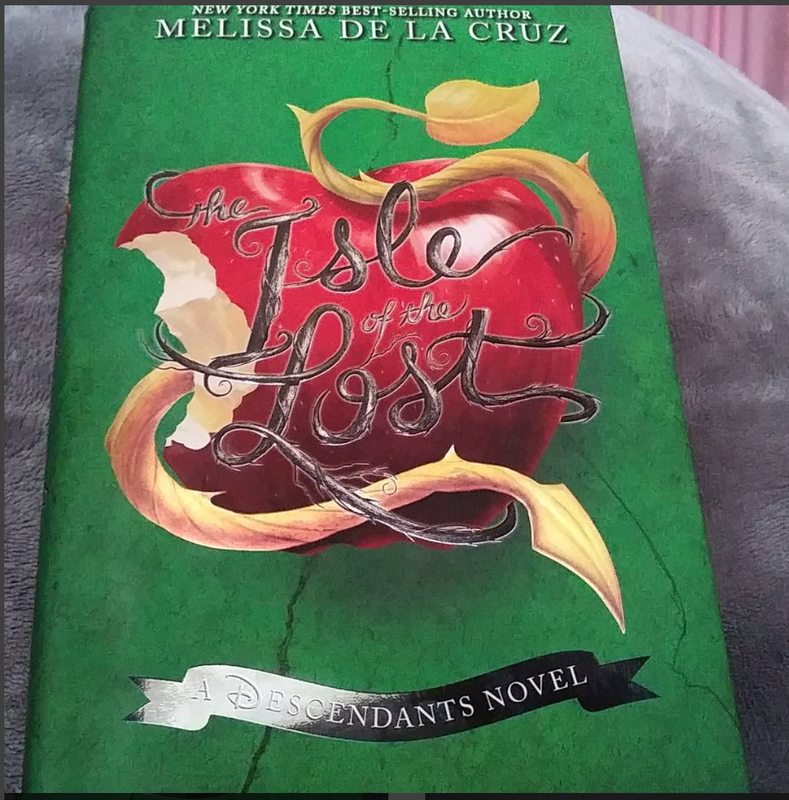 I rated this book a 2.5 stars out of 5 simply because it is a Melissa De La Cruz novel. I usually find her books very enjoyable. Melissa Writing is amazing and it also seems to be a little bit unique to each story. Now I might have like this book better if I had read it before the first movie.This book is about Mal, Evie, Carlos and Jay becoming friends but it reminds me to much of the first Movie. It has a very similar storyline to the first movie. In this movie they go looking for the Dragon eye Scepter for Maleficent, in the first movie they go for the fairy godmother Wand. The book they learn the meaning of feeling the same as one another and facing the same issues they also do this in the movie. The first movie was very similar to the book but at the same time I found that the first movie would have been far more enjoyable then what is given to us in the book. I am rarely a girl who prefers the movie over the book. I never have been but in this case that is what is happening here. I feel like the first book has no connection to the new books in any sort of fashion. Book two and three seem to take on the story of the movie and build from there as to where Book one is all by itself. I would honestly go so far as to say you Don’t need to read book one to understand the new books or movies and to me that sad. The only thing I did like in book one, that had value was Prince Ben opinion on becoming a new king. So if you love Melissa and really want to read everything by her or you want to know Jay, Carlos , Evie and Mal beginning friendship, go ahead and read the book but thats about the only thing you need it for. All of the links for book, Author and my Social media will be below. Please follow and subscribe if you like this review.